chokka blog: Who Do "Business for Scotland" Represent? I also had looked at the BfS website and wondered who and how many they were. There are so few mentioned on the site I assumed they had other members who chose to remain anonymous for one reason or another. Maybe not. The other claim they make is to be a 'business/economic policy think tank.' Now I'm as sceptical as the next person about many 'think tanks' but I can see absolutely no evidence, capacity or budget that would justify this claim. It would be interesting to see any research or policy papers they had produced and who their clients were. 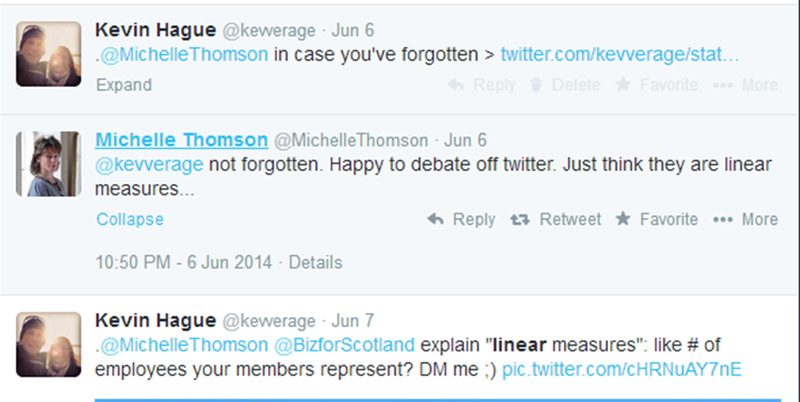 Apropos BfS membership and whether or not it is open or in any way extensive, I find Michelle Thomson's first response interesting. Surely a group formed of and representing businesses and business people would be interested in, first of all, capturing your ( ie any qualifying person's) membership (thus expanding their own base and credentials, not to mention what ever financial levy they extract from members). Instead she invites you to an open meeting to hear the view of their directors and founding members. I say that with the experience of working in a firm of solicitors that includes the secretary of a body representing solicitors and their interests; membership is everything, if you wish to actually reflect and promote the interests and values of the industry you purport to represent. I commend Kevin for his hard work in setting all of this down in print but I wonder if it comes as any great surprise to anybody, in particular those involved with Business for Scotland and the commissioning editors at the media outlets that are inviting them to comment. I'm a member of Business for Scotland but I don't represent that organisation in any way and any comments that I am making here are personal. I've never been involved in politics in my life, apart from a brief dalliance with the Student Representative Council many years ago. The current campaign has been an eye opener for me in so many ways, but most notably the fact that our lives are run by politicians and yet so many of the public are disinterested in the political process. That's what makes it relatively easy for a small group of well organised and motivated people to appear to punch above their weight in terms of media coverage and representation. The fact that the "establishment" has found it hard to compete with such a small group on some occasions (see John Boyle v Ivan McKee on Sky TV for an example) must be a concern to those who hold an opposing view to mine. Regardless of the outcome of September's vote, there's a lesson here for everyone. If you want your voice heard and your views represented, then you need to do something about it. I greatly admire those that are doing so on both sides of the debate and will defend anyone who puts across a reasoned argument for the status quo despite it being a contrary view to mine. Finally, I hope that Kevin will indulge me in a spot of "whitabootery". I think it's a bit rich to moan about a small group of self funded pro-Yes campaigners being unrepresentative, when we have the Vote No Borders campaign spending hundreds of thousands of pounds appearing from nowhere and getting wall to wall BBC coverage on its launch day. That looks to be the establishment and money in its full pomp and it's unhealthy for democracy regardless of your views on the referendum. I hope that after a Yes vote you will get involved Kevin, and make sure that we can have the best possible outcome for business in the negotiations between September and 2016. There are many business owners who follow BFS and want independence - sme or corporate. The reason why they are not members is so they can't be targeted unfairly due to their views. Well done on digging into the background of this group. Business for Scotland is clearly a sham in that it purports to represent itslef as much greater than the sum of its parts. Its a shame mainstream journalists havent been more assiduous in asking some critical questions about this SNP shell group. Self funded? You'll have evidence to support that statement? Well said Tom Hogg below. Like Tom, I am a member of BfS, although like Tom it is my own views I give here. Kevin I think you are setting up a straw man. BfS is a group of 1,500 plus individuals (the number is easily found on their web site) who have an interest in Scottish business and who believe that Scottish business would be better served by an independent Scotland. One joins by signing the declaration on the web site. If one donates £100 one becomes a director and part-owner. There is no requirement that members own or run a business, and no claim that they do so. So far as I know, BfS has never claimed to represent anyone other than these 1,500 plus signatories. The work of BfS consists of research and articles published through their web site, speaking at town-hall meetings, and media interventions. BfS is prominent in the media because economics plays a large part in the media debate, and because BfS spokespeople are good media performers - informed, articulate and courteous. I think BfS is a good grassroots organisation, and a valuable contributor to the debate on independence. Your research is poorly done. You highlighted one person who took your interest namely, Brian Murray. A quick google search would reveal his linkedin profile, which would suggest that he's actually rather well qualified. For a "self funded" "grassroots" movement none posting here as, even when directly challenged, been able to demonstrate where BfS funding comes from. We see references to a voluntary payment of £100 and to BfS's own unsubstantiated membership list. Taken at face value this gives a limit of £150k. Any advance on that? Anyone want to produce anything that might dispel the notion that BfS are a SNP front channelling SNP denotations from the usual, limited sources? @fatshez "Anyone want to produce anything that might dispel the notion that BfS are a SNP front channelling SNP denotations from the usual, limited sources?" If you seriously think the multi-headed grassroots independence movement from the Reid Foundation through Radical Independence to Grannies-for-Indy is a devious SNP front then you are seriously underestimating the challenge the Union faces. For reasons that are explained very clearly in the blog (and mainly to do with the level of media exposure the group gets) I'm asking very specifically about BfS. Not any of the other groups you named. Do you have anything to support tge comments made under this blog and specifically to confirm that BfS is self funding and run on the structure suggested above? @fatshez "Do you have anything to support tge comments made under this blog and specifically to confirm that BfS is self funding and run on the structure suggested above?" My comments gave information publicly available on the BfS website and in the media. If you require more information than that then you should contact BfS directly. I didn't highlight one person; I reviewed every one of the members profile and so he is included. I gave him one line as I couldn't find anything about him based on the published profile . I link to it and it gives no hint of company directorships which is quite clearly what I am looking at. His profile is in fact spectacularly vague. Maybe you can help me with his company directorships as his is a common name. I apologise if you feel I have not been thorough enough for you; I've put all my research here exactly so that I can be corrected if I've missed anything. I'm not sure what further openness and rigour you expect? Read his profile again; it doesn't give many clues does it? Suggesting I "singled him out" is ridiculous -- point me to his company Directorships and I will add them. I have done, several times, no answer. I'm left with the reasonable conclusion BfS are funded by SNP and are simply a front. @fatshez I honestly don't know if BFS is an SNP funded front organisation. From where I stand in terms of my involvement, it doesn't look or feel like it. I have paid £120 for each of two years to be a member of the co-operative and have also part paid for some venue hire and some teas and coffees. I've hosted a single meeting FOC in my own office. I'd not be surprised if some of the better off members of the organisation have done similar things on a more expansive basis relating to resources and manpower. Now that we are in the regulated period the spending position will become clear after the referendum when the Electoral Commission publish their returns. My expectation is that you will find no SNP money in BFS. But what do I know? I'm just a small businessman willing to use his own name and give an honest opinion. Maybe I've been duped. and I'll later regret not heeding the advice of an anonymous commentator on a public blog. @fatshez "I have done, several times, no answer. I'm left with the reasonable conclusion BfS are funded by SNP and are simply a front." OK you got me. BfS is run by the SNP, and the SNP is run by SMERSH, and this conversation is taking place in the Matrix. Chris Sheridan, details available through profile and in twitter. Where do you think BfS get their money? Chris Sheridan, details available on twitter. You haven't thought to question the funding of this group? Have you seen this much talked about membership list extending to 1500 members? As a solicitor I'm a member of several professional bodies, both representative and disciplinary. I can't imagine contributing funds to these bodies without absolute transparency about their accounts. @fatshez "Where do you think BfS get their money?" I think they're powered by enthusiasm not money. I don't think they have any money to speak of. Their activity is typical of a grassroots, shoestring campaign group - social media, town hall meetings, media interviews. None of this costs much. They have a writer, Michael Gray, who may or may not be paid a bit. Their spokespeople I assume are unpaid. They want to do some videos that need a bit of cash, and have issued a crowd-funding appeal for £30k, of which £12k has been raised. It's on the web site. You're looking for a money trail, and there is no trail, because there is no money. As for the membership list, if they say it's 1,500 then it is. I signed up, and I know quite a few others who did. Do you think there aren't 1,500 people in Scotland willing to support them, when all around you there is a huge popular push for independence? I really can't understand what all this is about. You and Kevin seem to think you have uncovered some scandal, when you're just flogging a rock. Have you contributed? If so, have you seen their accounts? If not, have you asked? Do you expect to see uptodate accounts at any forthcoming AGM? @fatshez "Have you contributed? If so, have you seen their accounts? If not, have you asked? Do you expect to see uptodate accounts at any forthcoming AGM?" Yes I have contributed. No I have not seen their accounts. And I have no interest in an AGM. It's not a professional association. I have no long-term relationship with them. It's a campaign group. It'll be gone in October. My exposure to them is £100 to join and £10 for their crowd-funding appeal. I like the people I have spoken to. I think their research is good, and their media performances have been excellent, so I have no problem with the way they spend the money. I could ask to see their accounts and their membership list, but I have better things to do and so have they. On which point Chris I will bid you good night, because there really is no issue here to discuss. So on the open platform of a blog widely publicised on twitter today no one from BfS can explain where they get their funding or claim to have access to either the much trumpeted membership list or a set of accounts? Jeezo Chris when you're in a hole stop digging! The blog post is wrong. It claims that BfS membership can be "fairly summarised" as 64 individuals. It fails to mention the figure of 1,500, easily accessible on the BfS web site. And that figure of 64 does not include me or Tom Hogg (commenting here) or the others I know have joined. If I know a few who have joined you can be quite sure many, many more have joined that I don't know. You have no reason for disputing BfS' stated membership figure, and no reason for thinking there is any hidden agenda behind BfS' funding. Kevin needs to fix his blog post, and you should stop making accusations you can't motivate or substantiate. Have you asked to see the membership list? Why isn't it published? A healthy membership would go along way to addressing the credibility gap highlighted in the blog. Have you seen accounts or asked to see accounts? Right now all you're doing is pointing out you disagree with the (in the case of the blog itself) well researched and reasoned points made, but have no further research or reasoning to add. 4. I am not arguing that I've uncovered some spectacular scam; I am merely making sure that the public statements made by "Business for Scotland" are read in an appropriate context and - which is where I came in - whatever the group represents it does *not* represent Scottish Business in any meaningful sense. I hear what you say, but it cannot be right to publish a blog post which claims that BfS membership can be "fairly represented" as 64, and just not mention that their own website states that over 1,500 have signed their pledge. In my opinion you really need to change your post to acknowledge that these 64 are a (known) subset of a much larger (albeit unknown) whole. BfS have nearly 2k members, 13k Twitter followers, and YouTube plays up to 12 or 13k. They speak to packed town halls, and are regularly invited onto TV and radio. They are a genuinely popular outfit, not some astroturf front. Beyond that I have no quarrel with the content of your post. I'm just not sure why you think anyone would be surprised at its content. I don't think BfS has ever claimed to represent Scottish Business as a whole, as opposed to the 1,500 signatories who are I am quite sure of all shapes and sizes, including the odd dog. 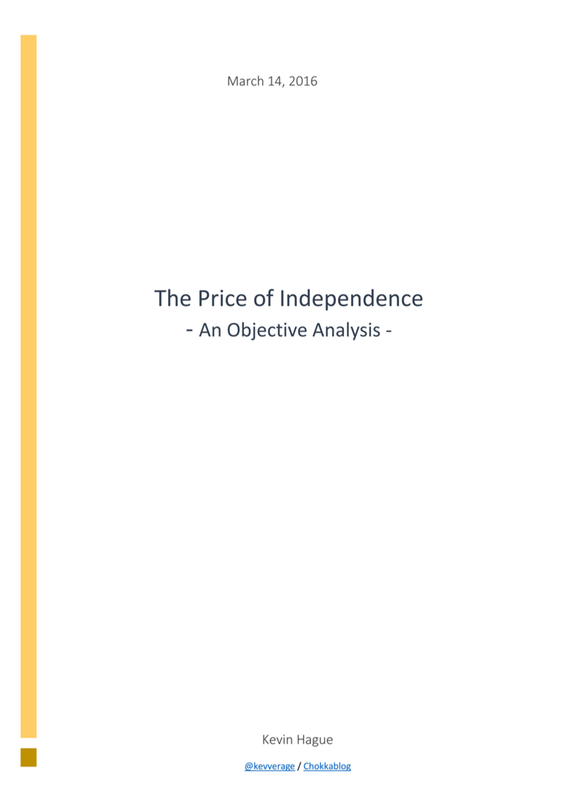 You have done good work on the economic risks associated with independence. I like that work better than this current post: speak to the message, don't shoot the messenger. I do say "identified members" that's all I can work with ... And "are regularly invited onto TV and radio" is exactly what bugs me. Why are they? I'm a member of BfS and employ (part time) myself. I see Yes! as a fantastic opportunity for developing the economy in Scotland to benefit those primarily who choose to live and work here. I get the feeling from your comments that this "smallness" makes my contribution or support of BfS less important. 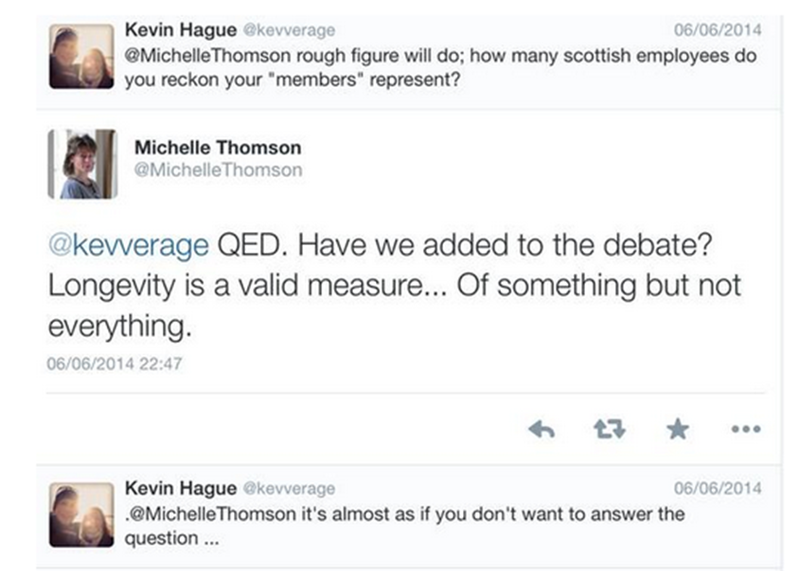 You seem to be making the point "how many employees do you represent?" Why is that important? Surely each individual has one vote so this is a mute point you seek to make. It is a fools errand to push for representation of "big business" in this debate, they are clearly allowed to contribute but to question the relevance or high profile nature of BfS as an issue is to miss the point. We are individuals, motivated by this opportunity to make change happen, we are not sitting back and waiting for the organisation you would prefer to see doing this for us. That, in my view is the difference, we as an organised group are being active and the high profile nature is a result of this effective organisation. As far as the SNP is concerned, why is that relevant? In the context of the debate across the media I would hope and ask you to dedicate as much time and attention to the No camp and just exactly who are they being supported by. I would compliment you on your efforts; a very instructive piece and well laid out. It would be amplified in effect if you had "the other side" also put under the spot light - good luck with that and I look forward to your talents and passion being put behind an independent Scotland after a Yes! I always figured that BfS was an snp front dressed up to look far more significant than it actually is but i didn't have the inclination to go digging so well done. Keep it up, the no vote is in the bag but it would be nice to keep yes below 25%. Very interesting and confirms my dealings with Michelle and the other guy who runs it. Way back last year I was discussing independence with them on the site forum and was removed once the argument started to go aginst them. One apsect that I do object to is that they post articles written for them and promote them as ''an independent financial advisor tells us why he's voting yes'' anbd it turns out the guy is one of the leads for the Third Sector for YEs campaign. Thats not very honest. I see that their Indiegogo crowdfunding campaign, which ends this week, has been a disaster - only 168 donars. That really says it all. Why any media operation would want to take soundings from the people running it is beyond me - they are not exactly bright or even succesful. If 95% funded via 433 individual donors with 3 days to go is a 'disaster' then can you let me know how to go about running a successful crowd funding campaign? I think the blog post is successful in its stated purpose of showing that business for Scotland is not a wholly representative organisation although lets be fair - is the CBI? Although BfS have gained significant airtime I have never seen them portrayed as anything other than a yes supporting group of business individuals which it is hard to argue against. Surely it is a good thing that the debate is balanced with an alternative narrative to the (not unfounded) mantra of business risks under independence which highlights that they're might indeed be specific opportunities associated with a Yes vote as well. As for fatshez's ludicrous conspiracy theories about their being an SNP front the less said the better. What sort of money are you suggesting they've actually spent? As has already been pointed out their voluntary membership fee would appear to be more than enough to cover the nominal costs of maintaining a website (and potentially funding a writer), running town hall meetings and making a few youtube videos. BfS is not funded by or linked to any political party; the members I have met (over a 6 month period) have never discussed political allegiances but have spoken of their desire to have a Normal country. A country which governs its own affairs. Economically there is no issue to address. Scotland is being held back because of its resources & anyone who suggests otherwise is looking through an obscured Unionist/Daily Mail lens. JT. I would suggest that since there is no shortage of different yes grass roots groups, the vast majority of bfs members are or see themselves as business people. Or it could be that l should have declared my interest and targeted my donations to "Granny's for Yes". Im sure that, as myself, many would like to maintain a degree of anominity, considering the possible negative impact on trade from individuals and other businesses who do not hold the same beliefs. I have suppliers and clients on both sides of the border and the debate. I also have staff who no doubt will vote differently from myself and it would not be right to declare my beliefs in the name of my company. You seem to have put alot of energy into your research and I commend you for your dedication. But you don't have the information you would require to have a conclusion. The commitment of bfs, the whatever for Yes, the whoever for indy, the thousands of campaigners who chap doors are the ones who will be able to look back and feel a part of something good. The gate is open. 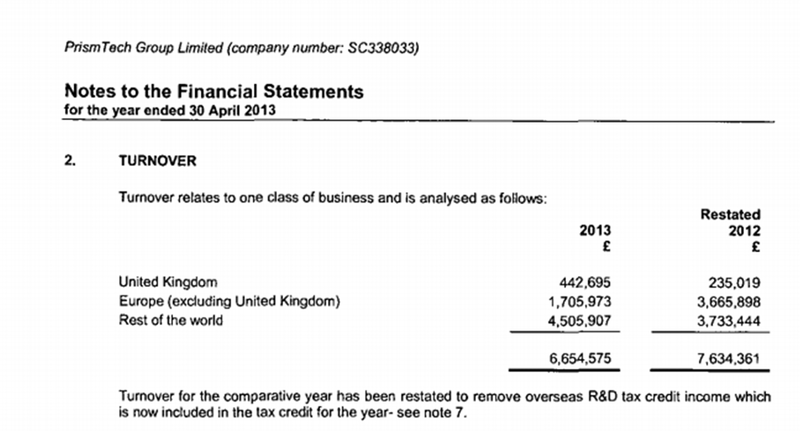 I'm a BFS member but as my business is structured as sole trader it wont be listed in companies house. Maybe you should have considered that for part of your "research". I was trying to assess whether the BfS membership includes any businesses with a significant number of employees and material trade with rUK. I'd asked the question directly and as you can see was not answered so I did the research myself. I go to great pains to make it clear that I am not casting any aspersions on the people who may have small companies or who are sole traders like yourself - and recognise you have an entirely valid view on the independence referendum question. I'm merely pointing out that a very significant business constituency is not represented *at all* by BfS - and it is that very constituency that is concerned about the Scottish employment implications of a Yes vote. let's get one thing straight, BfS members. You comment here that you are a fledgling organisation of business people who believe in the YES campaign. But that isn't what you portray yourselves as nationally is it? By using sophisticated social media marketing techniques you have catapaulted yourselves to the 'go to' body representing scottish Business in the Yes camapign. So don't complain when the spot light and magnifying glass is turned on you. You cannot have your cake and eat it. This is a fantastic article - and confirms what I have thought all along. I was just beginning to research some of the companies and came across your blog - especially relevant with the article in the paper today. Well done and thanks for the work put into this. I have shared it and will refer to it again. Richard Arkless being one of the "new" 56 MP's ? Doesn't reply to "difficult" Facebook questions (any facebook questions ) but loves to write glowing episodes of SNP daiy life on his page, most other questions to him just get deleted , much easier than actually trying to answer them. Says he gave up from being a Business lawyer so he could start up an online LED company...can't see that being much of a huge business concern really. So what do we have going on here today ? Another Slo-mo road accident amongst the Business for Scotland fraternity ? Why hurriedly resign your Directorship if you have nothing to hide ? Hopefully the authorities here look deep into Richard Arkless's business practices... who knows what they might dig up. Have another Gin or two tonight Kevin. Another casualty among Scotland for Business members ? Any chance of updating all the new known information on members that is now available perhaps so it can be seen when reading the main article ? We know at least two of them later became SNP MP's too, one already fallen from grace. Perhaps you might want to update the McIntyre Kemp data ? I have just been blocked by BfS on facebook...I consider that a success...They are an SNP shill company headed by Aberdeen lawyer and staunch SNP supporter Rob Aberdein...I have obviously hit a nerve with my posts.I could post using another facebook profile but will just watch .How petty for a business (ha ha) to block someone.